Here’s a look at what I wore on Sunday to church! I always get a ton of questions about my weekly photo that I post to Instagram, so I thought I’d share all of the details with you. You all know how much I love pink (shocker!!!) so when I found this dress at Nordstrom I knew I had to have it! The detailed lace makes it super feminine and flattering! 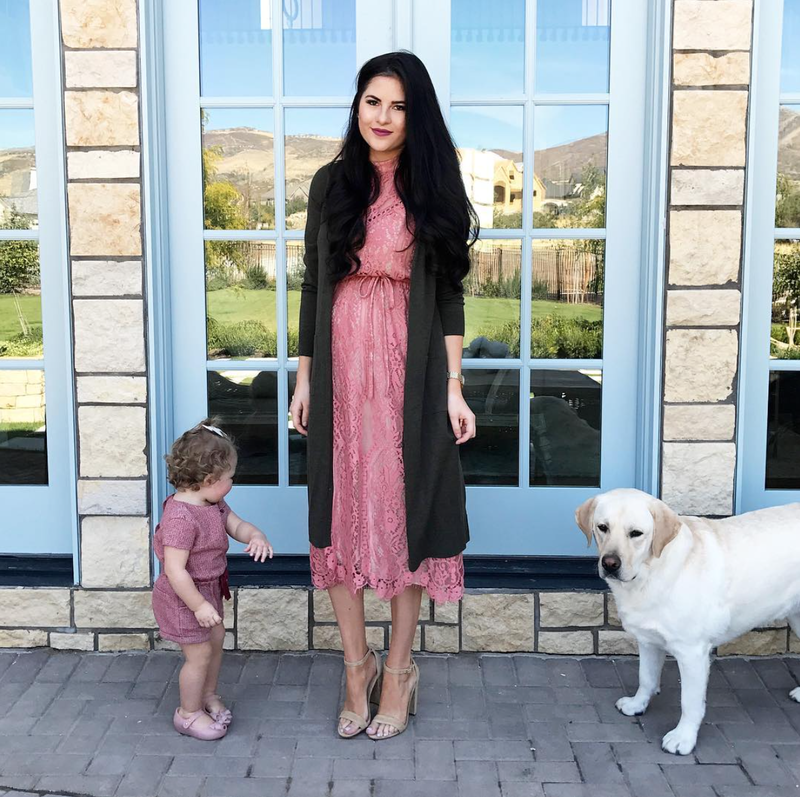 You may think you can’t wear this pastel color in fall, but fall dresses are quickly becoming my favorite thing to wear right now! Pair it with a neutral sweater or cardigan, your favorite handbag and a chunky heel and you’ve created the perfect, classy look for fall! Love that you paired a fun and bright summer dress with a fall inspired cardigan for the season. Looks great. What a lovely dress! Love the lace and the color is perfect! The pink tone is perfect for fall! Thanks! Yes I love this blush color for fall! You’re looking simply gorgeous in this feminine and Fall perfect outfit! I’m loving your pink dress! I love pairing items in unexpected ways, like pastels in fall :) You look stunning, girl! You look beautiful in these photos! Love this look! Love the color of this dress! Absolutely gorgeous! I love that you are embracing your post baby body and not nagging about it! It’s the worst when people think its not normal to take time and allow your body to heal! LOVE you for that! Beautiful! I love how you paired the dress with the long sweater. This also makes your hair color really pop! I love everything about this outfit. I would have never thought to pair a green pullover with a pink dress. It looks absolutely stunning. I’ve seen this dress everywhere and for good reason, it’s SO cute! The cardigan on top of the dress is unexpected and SUPER fall forward in an adorable way! I am in love with this rose pink color this fall! You look so beautiful and you are serious post pregnancy goals! Such a pretty dress for fall, Rach! You look beautiful, and does little Ms. Isla! Melts my heart! That dress is darling. I love how you paired it with forest green! So pretty. I love that you dress appropriately for church. (I’m so tired of looking at flip flops and yoga pants during Sunday mass. I’m probably old-fashioned, but it seems rather disrespectful.) Your collection of long cardigans is definitely making me realize that I’m missing this staple from my own wardrobe and need to correct that for Fall. That dress is gorgeous, and I love how you paired it with the long cardigan! This should be your signature lip color! Looking amazing. Hope Jackson is doing well. I love the look of these two colors paired together, they look great for fall and the detail and style of this dress is so beautiful on you! Thanks so much for sharing, beauty, and I hope you’re having a great day so far! absolutely stunning, girl. You are fall ready and gorgeous! Gorgeous as usual! The colour suits you!